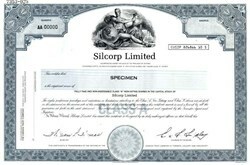 Beautifully engraved SPECIMEN certificate from Silcorp Limited. 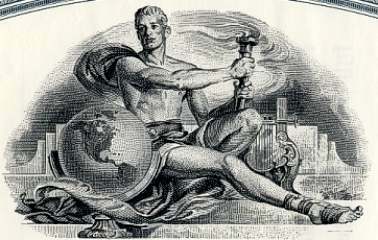 This historic document was printed by the British American Bank Note Company Limited and has an ornate border around it with a vignette of an allegorical man holding a torch with both hands. This item has the printed signatures of the Company's Chairman of the Board and Secretary. In April, 1999, Alimentation Couche-Tard Inc. acquired Silcorp Limited, which was until that time a publicly-traded company. Silcorp Limited is now known as Mac's Convenience Stores Inc.